Ivan Generalic is now heralded as the original driving force behind Yugoslavian naïve or outsider art. He was born in the small town of Hlebine in 1914, where he also attended the local primary school until he was deemed old enough to work as a cowherd and a peasant farmer. Ever since his earliest memory, Generalic would draw with whatever materials he had available, whether it was a freshly painted gate he adorned with chalk, a patch of earth he engraved with a sharp stick or the drawing block and pencil he took to carrying around with him. 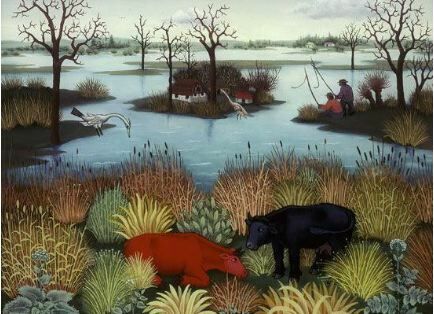 When the other cowherds would take a break for a nap or a bite to eat, Generalic would retrieve his drawing materials and record the life of peasants without romanticizing the hard work and the apparent exploitation. He claimed that initially his neighbours did not think much of his work because it did not fulfill their notion of what art ‘should’ be. However, since Generalic drew for his own personal fulfilment and not for critcal acclaim, he continued to record his vision of the lives lived around him. Acclaim did follow, although it was first voiced in the more urban centre of Zagreb rather than from the locus of his inspiration. In 1953 Generalic moved with his first wife, Anka Kolarek, to Paris, where he worked and exhibited for two months. Although this move increased his exposure to a variety of art and experiences, and did inform his work, he never lost his own manner of painting and he continued to depict his own ideology and peasant values. When Anka died in 1975, Generalic moved to Sigetec, another village close to Hlebrine, where he married for a second time. He continued to paint and enjoyed offering guidance to younger artists, such as Dragan Gazi, of the same region. In 1992 Generalic died, leaving behind an inspired art movement.